At some time you may have felt drawn, through a friend, spouse, or during Mass, to explore the Catholic faith. It may be a quiet but insistent inner urging; it can feel like an irresistible and powerful need. Sometimes it seems absolutely clear and certain, something you have known all along. Other times, it is a tentative question, full of uncertainties, unknowns, even anxieties. It is important to take these yearnings for “something more” seriously because they are often the way we are called to deeper spiritual growth, to deeper communion with God and all of life. 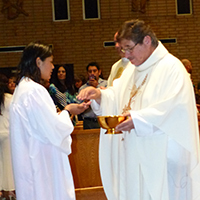 No matter how the feeling arose or what its shape is for you, if you would like to learn about the Catholic faith, we invite you to explore the faith through a process called Rite of Christian Initiation of Adults (RCIA). 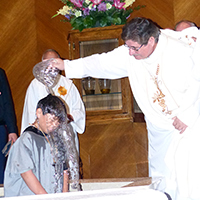 The Rite of Christian Initiation of Adults is available to adults, teens, and children of catechetical age (seven or older) who have never been baptized and who are seeking membership in the Roman Catholic Church. The RCIA welcomes those baptized in other Christian denominations who wish to join the Catholic Church by making a profession of faith. Participants in the RCIA process, known as catechumens (Greek for “those being instructed”), prepare to receive the sacraments of baptism, confirmation, and Eucharist. Modeled on the practice of the early Church and restored by the Second Vatican Council, the process involves conversion, reflection on Scripture, formation in the gospel way of life, and integration into the faith community. Various rites, or rituals, mark the individual’s progress on the journey of Christian initiation. The RCIA process incorporates four stages. Precatechumenate: a time of no fixed duration or structure for inquiry and introduction to gospel values and to become acquainted with the faith community. No commitment is expected at this time. Catechumenate: a period of no fixed duration for nurturing, growth of faith, and conversion to God. Catechesis and faith sharing are a part of this period, which includes the rite of Enrollment of Names and Election. The individual commits to attending Mass on Sundays and to participating in dismissal during Mass, an opportunity to study the readings for that particular Sunday. Enlightenment: a time (usually the six weeks of the Lenten season) preceding full initiation, which includes prayer, reflection, and intense preparation for the sacraments of initiation, celebrated at the Easter Vigil. This period includes the Scrutinies and presentations. Mystagogy: the period following the Easter Vigil celebration of initiation (the seven weeks from Easter Sunday to Pentecost), which completes the initiation process. The newly initiated experience being a full part of the Christian community. They are members of the assembly for the entire Sunday Mass and receive Eucharist. This period includes pertinent catechesis and reflection on the meaning of the Easter sacraments. All who want to learn more about the Catholic Church or becoming Catholic are welcome at the RCIA sessions. Friday 7:00 p.m.– 9:00 p.m.
Monday 7:00 p.m. – 9:00 p.m.
Two Wednesdays a month: 7:30 p.m.–8:30 p.m.
©2014-2019 St. Joseph the Worker Catholic Church. All Rights Reserved.